Source: Bloomberg, Bank and author calculations. What do we take from this? A few things. First, the increase in yields seen in the US and the UK over past months was not trivial. Second, such bond market reversals are not unpreceded (a point made over a much longer time period by Paul Schmelzing in a previous post). And third, the pace of increase in each of these cases is broadly similar: around 80bps over 50 days. There are also caveats here. 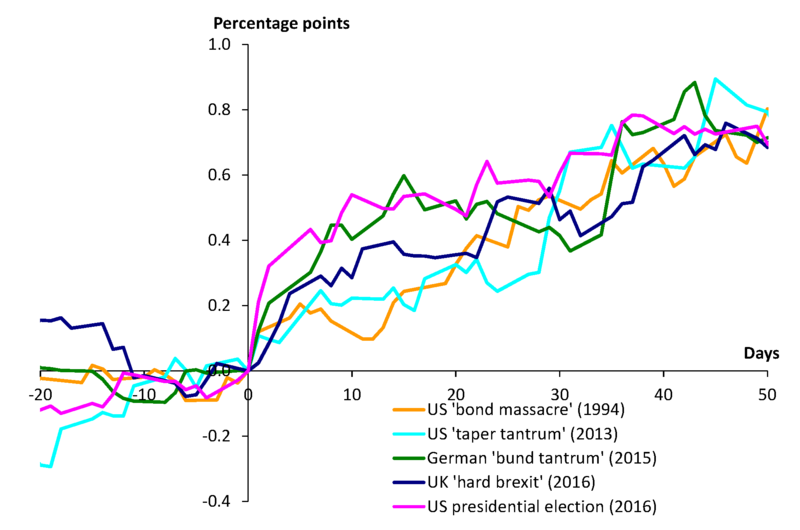 We’ve picked the clearest and biggest examples of large and persistent yield increases – possibly giving rise to selection bias. But the similar pattern perhaps indicates something more fundamental about momentum and trading dynamics in bond markets. And while the recent moves were not trivial, yields are still low relative to historic averages. Julia Giese and Matt Roberts-Sklar work in the Bank’s Macro Financial Analysis Division. Next Post Is economic uncertainty holding back growth in the euro-area? Nice graph. Could add JGBs in 2003, I think that would also sit on top of the other 5 curves.